GARTNER Signed ABSTRACT Painting Pastel Drawing TIKI ISLAND Vintage Modern Art! Fresh from an estate. Interesting mid-century abstract art. Hand signed "Gartner". Island flavor with tiki huts, plants, pool, water, mountains. It looks like there maybe an outrigger canoe on the one side? Hawaii? At least thats my perception. It's "abstract" influence is strong in areas. It appears to be done in a mixed media of brown pen ink, with pastel coloring and maybe some watercolors. Art is matted and framed. It is all original as found. Intact, underglass, paper backing in place with no tears. It will need to be reframed and matted as there is stains along the right side on matting. The artwork does not appear to be affected as far as what its showing. Framed size is 20-1/2" x 23". Actual showing artwork, 13-3/4" x 16" Thank you for stopping by and I look forward to having you as a new customer Bid with confidence! Antique HARRY LINDER 1886-1931 CALIFORNIA Pastel Autumn Road Painting Orig.Frame This is a beautiful original early 1900's Pastel on Paper, signed landscape. By the notable listed California artist, Harry Linder (1886-1931). Harry was born in Finland and moved to southern California in 1917, where he established a gallery for his work and other local artists. Pastel was done with autumn scene, the meandering river with a road beside it and wooded areas around. It is signed H. Linder on the bottom left corner. It comes from an estate and is in its original grain wood frame. Pastel is 30"x10". Wood frame is 36"x x 15-3/4". The pastel is in very nice condition with no holes, tears, stains or repairs showing. There is lite dust lost to the glass as expected with the age and medium. The frame displays it fine, but does have some chips on one corner and some tiny flakes to the others. The back side has been taped and the backing has some tears, stains. Authentic early 1900' s Fred Thompson (1844-1909) hand-colored artist signed and titled, photograph. It is an interior view titled: Spinning Days. Thompson was one of New Englands most popular photographer in the early 1900's. In 1908 he opened the Thompson Art Company to offer his works to tourists and travelers. Although his works were very simular to Wallace Nuttings (another New England photographer) The Thompson's works are harder to find due to the short period of time they were produced. This piece measures 6-5/8" x 4-3/8", is mounted on linen textured matting with block penciled title "Spinning Days" on the left and block penciled signature "Fred Thompson" on the right. Above the signature on the matt, in the picture corner, © TACO. It comes in its original period frame that has not been opened. Pictures below show it behind glass and may show some reflections. Original wood backing is still in place, but the wood has a crack that allows one to see inside and it does carry the original TACO ( Thompson Art Company) backstamp. I was unable to get a full picture of this due to the wood backing, but it is the Triangle shaped back stamp with designs in the corner Fred Thompson Pictures - Oddities, No. 6310? (this is penciled in) D-a Col., Thompson Art Co. Portland Maine. Very rare to have the backstamps remaining intact. The picture appears to be in very nice condition still with no tears, holes or stains. The deep-well frame remains solid, intact and sturdy, but has flakes and chips along the edges and corners. It measures 14-3/4" x 12-3/4" x 2-1/2". Take a look at the pictures on this one. It is signed but I can't identify the artist. Its quite an impressive painting and the pictures don't really do it justice. It quite a large painting on stretched canvas and framed. 30" x 46" overall, with the canvas being 24" x 40", The medium appears to be acrylics. I'm guessing the scene is here in the US from the US flags. I would say it dates to the 1950's from the style of swimsuits and the model of the boat. It is in very nice condition. No holes, tears or dents to the canvas. The painting is still vibrant and unfaded. No stains. I don't know who "OR" is but they did a fabulous job on this work. Because of its semi abstract style it would be a nice addition to an mid-century, modern, eames era decor. Due to the size, shipping with a carrier can be quite expensive, Greyhound is an option, email for information. Antique Early Orig Framed Lg Osborne Ivorex Mr Pickwick Wall Plaque Rare EXC. Unique, extremely rare, framed ivorex plaque featuring "Whist at the Assembly Rooms Bath "poor Mr Pickwick". Designed by Arthur Osborne and made of genuine Ivorex. Produced in Faversham, England, circa 1899 - 1943. The lower left corner has the engraved AO initials which were used until Arthur Osborne's death in 1943. (After his death the initials WD were used for Walter Davis). 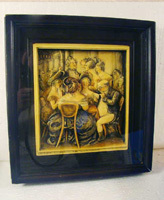 This large 7.5" x 8" plaque is in excellent condition as it was one of few purposely framed behind glass for display. 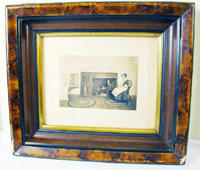 The black wood molded frame is 11.5" x 12.5". The detail is phenomenal and the process of creation is unmatched in any other works of its kind. Wood frame has some storage wear on the corners, but still displays well. A must have for your collection. ORIGINAL SIGNED "VAN GAARD" OIL ON BOARD FRAMED PAINTING This is a fantastic vintage 60's piece of art for your mid-century modern decor! Its a large Van Gaard. Originally painted by Lee Reynolds Burr, the director of the Van Gaard studios, that was located in Hollywood California. Signed Van Gaard as Lee signed his paintings when he was running the studio. 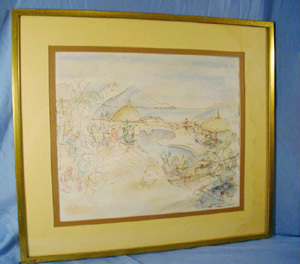 Nice long framed painting, 65-1/2" x 25-1/2". It appears to be an oil, but is actually a unique technique that is often referred to as "Drip Oil". First the background colors are painted in on th board, then acrylics and then screened lines are applied to the board. Running glue is then applied to create the raised effects, and the whole piece is sprayed with an oil sealer, making it an oil painting and giving it that appearance of a true oil painting. This unique painting portrays a European skyline. The painting is accented with the original frame that was also done in the Van Gaard Studios.. It has the VAN GAARD STUDIOS, Beverly Hills Ca. All original and in very nice condition and ready for display in your Eames, Mid-century, modern home. ORIGINAL PAOLO BONI "Graphisculpture" ITAGLIO PRINT! Paolo Boni a major twentieth century Italian artist was born in 1926 in Florence, Italy. In 1957 he received international recognition for a printmaking process which he developed-and-called, “Graphisculptures” This is one of his large modernistic metal relief prints titled: "Meta Phone". Hand numbered and signed, 18 of 32 , Boni 70. Each component was hand inked and the process of building up the different cut, hand wrought, and hammered metals gives it a multi level 3-D look. Very impressive in style and size. Sealed in frame behind glass as it was found in an estate. Very nice condition. It appears to have yellowed some with age? Frame measures 41 x 31" . The print size inside the matting measures 22-1/4" x 32-3/4". Paolo Boni prints are quite hard to find and most show up in galleries and museums around the world with few being offered for sale..